As most of you know, in July of this year, 2013, Judge Carl Barbier appointed former FBI Director, Louis Freeh, to conduct an investigation into possible misconduct by lawyers within the Deepwater Horizon Economic Claims Center (DHECC). This investigation was spurred from accusations of misconduct against Claims Center attorney, Lionel Sutton. Sutton has denied the allegations and has yet to be officially charged with any wrongdoing. Freeh conducted his investigation and submitted his report to Barbier's court on September 6, 2013. In the report, Freeh claims Sutton may have committed wire fraud and money laundering by accepting payments from the Andry Lerner law firm in order to expedite one or more of their client's claims through the Claims Center. According to Freeh, the payoff for Sutton was conducted "using circuitous and convoluted interstate wire transfers". 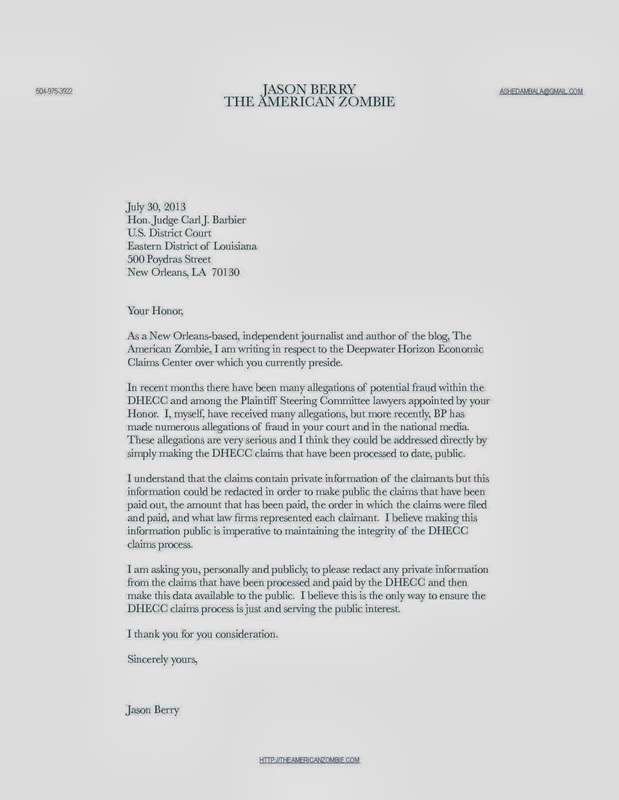 Freeh has also called into question Sutton's fiduciary duties as an attorney and his fiduciary duty to the DHECC, then suggested an investigation should be launched by the Louisiana Bar Association resulting in possible disbarment. Instead, Mr. Sutton concealed his improper financial relationships and interests, hid the receipt of his payments by having them passed to a defunct corporate bank account, misrepresented the payments when asked about them by a court official, and misrepresented his actions before the Special Master. "....concealed his improper financial relationships and interests...", I want to pick that up and go in another direction. The exact opposite direction...back towards Freeh. I didn't have the time to make nifty diagrams but I will try to break this down as simply as I can. - Louis Freeh is the Chairman of his firm, The Freeh Group. - The Freeh Group is a wholly owned subsidiary of the law firm, Pepper Hamilton, LLP. - Louis Freeh is also a partner and chair of the Executive Committee of Pepper Hamilton, LLP. - Another attorney named Greg Paw is a senior partner at Pepper Hamilton, LLP. - Freeh, Greg Paw (paw@freehgroup)/Pepper Hamilton have had numerous business dealings with the law firm Kirkland & Ellis. - Kirkland & Ellis is currently representing BP in the Deepwater Horizon Settlement process. In fact, Kirkland & Ellis has referred clients to Pepper Hamilton in the past...and possibly the present. Where do you think I'm going next? Take a break for a second...look back over that chain of factoids. - Greg Paw and the Freeh Group are currently deeply entrenched in the Deepwater Horizon Economic Claims Center. Paw's reported title is "Special Master's Attorney", the Special Master being Freeh. I think the Marquis De Sade set up this titling hierarchy in case you're wondering. Despite his title, the question really is, "What is he doing there?" Reportedly, Judge Barbier has given Freeh, and his business partner Paw, total domain over the ability to not only deny claims but "claw back" claims that have already technically passed through the claims process. Let's call Freeh a claw-back Czar....kind of a big deal, huh? In fact, other employees of the Freeh Group are now being brought into the DHECC. 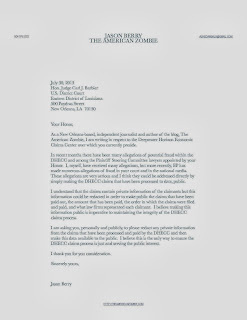 American Zombie - The DHECC claims process from Jason Berry on Vimeo. I've also been told that claim approvals have ground to a halt with Freeh's entry into the Claims Center. The Andry Lerner Law Firm has filed a memo in Barbier's court to get info for a possible motion for recusal of Special Master Freeh . Their motivation is obvious, to invalidate Freeh's report, but in the memo they lay out some of the connections I mentioned above and Freeh's apparent conflict of interest. There is also a series of questions to the Judge regarding the entanglement of Pepper Hamilton with Kirkland & Ellis. 1. How many Kirkland and Ellis lawyers are working with Freeh Group or Pepper Hamilton lawyers currently? What is the extent of the financial relationships between the two firms? For example, are the referrals from Kirkland & Ellis dependent on cooperative endeavors, or fees shared, and is there an ongoing back and forth relationship, Pepper to Kirkland, Kirkland to Pepper, or Freeh to either one? 2. What are the ecomomic consequences to the Freeh Group of past and current associations with Kirkland & Ellis? 3. What are the economic consequences to the Pepper Hamilton Group of past and current associations with Kirkland & Ellis? What is the actual status of the ongoing cases? Did these precede this appointment? What fees have been paid since this appointment? What fees are anticipated in the future in relationship to those cases while this appointment continues? 4. All of the pre-Special Master contacts between the Freeh Group, Pepper Hamilton attroneys and Kirkland Ellis attorneys. The amounts of money received to date and anticipated to be received in the future by The Freeh Group or Pepper Hamilton as a result of this appointment, which ultimately must be approved and paid by BP. 5. What are the lines of authority, vis-a-vis, the co-defendant clients in relationship to the cooperation with BP versus Pepper, or in conjunction with Pepper on these litigation and counseling matters? 6. Are there currently under consideration future relationships between Kirkland & Ellis and Pepper, or Kirkland & Ellis and Freeh? 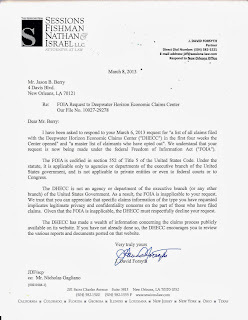 The Freeh Group has succeeded in putting an embargo on legitimate claims with erroneous assumptions. Simultaneously it is benefitting internally through its billing, and externally through its advertising , from its own findings. It requires no imagination to understand the value to BP and by extension its law firm, Kirkland & Ellis, of the criticisms made by Freeh. A simple look at the ad attached to this motion run by BP immediately after release of the Freeh Report satisfies the benefit (Exhibit 2) A review of Exhibit 1 shows Freeh advertising his work that helps BP, and Exhibit 2 shows BP advertising the work of Freeh. At the same time, Jon Andry's clients and referral attorneys are being denied claims already approved twice by the Claims Office. Read the whole memo and this motion filed to determine the request for Freeh's recusal as it states a specific case where Pepper Hamilton and Kirkland & Ellis are litigating together as co-counsel, the Avandia National class action. Now...I'm pointing all this out not to argue Andry Lerner's case. I'm pointing it out because this may represent a clear collusion between BP, the folks running the ship at the DHECC and possibly with the Plantiff Steering Committee (PSC) lawyers. Possibly worse than that. 1. PSC lawyers - were they aware of the Freeh/Pepper Hamilton conflicts with Kirkland & Ellis before Freeh was named as Special Master? If so did they waive the possible conflict of interest? They have a fiduciary duty to the claimants along the Gulf Coast who file claims with the DHECC, why are they not bringing up these issues instead of Andry Lerner? Are we to believe Herman, Roy, Fayard....top national attorneys.....see no conflict of interest with the relationship between Freeh/Pepper Hamilton and Kirkland & Ellis? Why have they allowed Freeh (and peeps) to be inserted into the DHECC as a "Clawback Czar"? Freeh claimed he disclosed the relationship between Pepper Hamilton and Kirkland & Ellis before he was hired but I'm having a hard time understanding how this conflict of interest was waived by the PSC, if that's what happened. 2. Judge Barbier - was he aware of the Freeh/Pepper Hamilton conflicts with Kirkland & Ellis before Freeh was named as Special Master? Freeh said he disclosed it so I assume he was. How could he have waived this conflict? More importantly, how can he justify allowing it to go on? These issues are huge. Why would the PSC and Judge Barbier sit idly by and allow this to occur? They may all have breached their fiduciary duty, every damn one of them. There may need to be a separate investigation into how Freeh was chosen to conduct the original investigation. Wouldn't that be something? As I've stated before, I have reason to believe that at least some of the PSC attorneys used their power and influence to manipulate the Claims Center to get their private claimants paid before everyone else's...exactly what Sutton has been accused of by Freeh. I was also informed that some of the information in the claims is private, such as Social Security #s, so I drafted a letter to Judge Barbier asking him to redact any private information in the claims and make them public in order to ensure transparency and resolve the allegations. Not surprisingly, I didn't receive a reply. I get that I'm a lowly blogger and probably don't warrant a Federal Judge's attention but I think the people of the Gulf Coast do warrant his attention and deserve some answers to these allegations....especially now that these issues have been exposed with Freeh, Pepper Hamilton and Kirkland & Ellis. I don't see how it can be ignored...not now. It's worth noting that there was a clear collusion between BP attorneys and PSC lawyer, Steve Herman, in respect to the Wisner case. But it seems no one is too worried about that, either. Barbier and Juneau keep trumpeting that the DHECC and the claims process is transparent. That's ironic considering we don't even know who's working in the office, what their roles are, their salaries, how those salaries are being paid, etc. One interesting development I did confirm with the Claims Center was that Appeals Coordinator, David Duval, son of Federal Judge Stanwood Duval, Jr., abruptly resigned two weeks ago on October 7, 2013. I don't know what prompted his resignation but it's curious. Great stuff! What a can of worms that has been opened! The quiet resignation of David Duval - too much to get into at this hour. Did David Duval resign for any reasons connected to the information appearing in the Freeh report? Is he prevented from assisting anyone in bringing BP claims? Is he working for the family firm in Houma? How many BP claims has the family firm brought for others? Did he work or help or have lunch with anyone on any of those? Did he have any involvement in any BP claims where the CPA firm Bourgeois Bennett was also involved (his aunt is a principal in that firm)? Same question for Duval Shearer CPA? Is David Duval involved with the Crescent City Group? Who hired Kirk Fisher and why? Who hired David Odom and why? Who hired all the other MBAs from the Class of 2012? Did the MBAs have preferential knowledge of or access to these claims center jobs? Were there any other applicants for these claims center jobs now held by the MBAs? Were any other people interviewed for these jobs? Do the MBAs work for the Crescent City Group? What kind of work is done by the MBAs and does it take someone with an MBA to do it? Is Michael Olinde the treasurer of Crescent City Group? Did Kirk Fisher know Michael Olinde before 2010? Did David Odom know Michael Olinde before 2010? Did they graduate from high school together? Before 2010, did they invest any money together? Last question (for now): What is it y’all say I did wrong, again? I’m wondering if Pat Juneau is one of the “other persons” to whom Mr. Andry wants access. He does list Pat’s son, Michael.